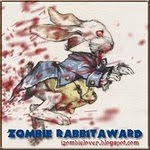 I am giving this award to  of my favorite blogs and places i believe need some well deserved attention. I thought it might be fun to shake it up a bit, sort of a "Pay It Forward" move... let me explain. 01) Give the award to  who you like, but give a couple the "Next Blog" slider button on top... so random blogger people can feel the love from a stranger. 02) Post those you gave the award to, so fans of your site can see the places you like and Paid It Forward too. Now if you have got the "Rabbit" from someone or me, please just "Pay It Forward"
You should get in contact with my friend Andy Edwards who makes short zombie movies. His shorts started off as a bit of fun and were very low to no budget but he's starting his 6th now and is actually using proper actors - as opposed to us, his drunken mates. Wow, thanks so much! Really appreciate the awards....and that is a cool one! Off top post about it.